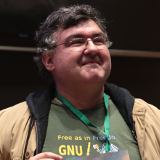 This is Alexandre Oliva's personal blog, that does not necessarily represent the opinions held by FSFLA, Red Hat, AdaCore or any other institution the author may be associated with. See also my home page, and follow me on the distributed P2P networks Twister (@lxoliva) and Secure Scuttlebutt (lxoliva), or on the federated and decentralized ones Diaspora, GNU social or Pump.io. This blog has different entries in Portuguese, Spanish, and perhaps in other languages. The following catch-all copyright notice and permission apply to all documents and postings in this blog that don't contain a copyright notice of their own, and whose copyright can be reasonably assumed to be held by Alexandre Oliva. Permission is granted to make and distribute verbatim copies of this entire document worldwide without royalty, provided the copyright notice, the document's official URL, and this permission notice are preserved. The following licensing terms also apply to all documents and postings in this blog that don't contain a copyright notice of their own, or that contain a notice equivalent to the one above, and whose copyright can be reasonably assumed to be held by Alexandre Oliva. This work is licensed under the Creative Commons License BY-SA (Attribution ShareAlike) 3.0 Unported. To see a copy of this license, visit http://creativecommons.org/licenses/by-sa/3.0/ or send a letter to Creative Commons, 444 Castro Street, Suite 900, Mountain View, California, 94041, USA. Please do not attack ships, especially while visiting this site! Today, I'm making generally available an article I've been working on for a few months, about software freedom and security, specifically the threats posed by Spectre and Meltdown. I've already presented a lecture about it in Portuguese at FISL18, and I'll present it in English about a month from now. Check my home page for schedule, slides and recordings.